We are pleased to announce a new Weekend Residency in the Print Studios project by writer and photographer Jeff Evans. Jeff came to his residency just days after the June 17, 2015 mass shooting at Emanuel African Methodist Episcopal Church in downtown Charleston, South Carolina. As a member of the Charleston community, Jeff was deeply affected by this event. He participated in and documented many community support gatherings–memorials, services, vigils, and political actions. 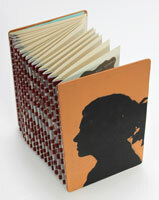 His residency project, SWIRL, is a handbound artist’s book. It is also available via Hunger Button Books as a print-on-demand edition. SWIRL is a creative reflection juxtaposing photographs, texts, local newspapers; and acts as a memorial for both the victims and Charleston community. Erin Manske and Maggie Manske were our Spring 2011 Residency Artists. These cousins came together during their shared spring break to visit us in California. The projects they created — although they are very different in both concept and form — both demonstrate a strong interest in interpersonal communication. Erin created a broadside which included her own collected writings. Maggie created a blank journal as a device to communicate with a person she seeks to be closer to. 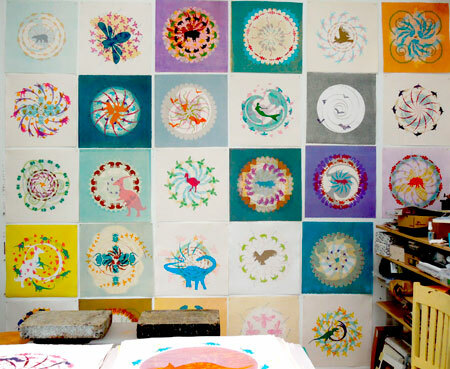 You can see Erin and Maggie’s projects at PreNeo Press Residency in the Prints Studios.